Owing to years of experience and knowledge, we offer wide assortment of Sim Card Connectors. These Sim Card Connectors are extensively used in the manufacturing of mobiles. 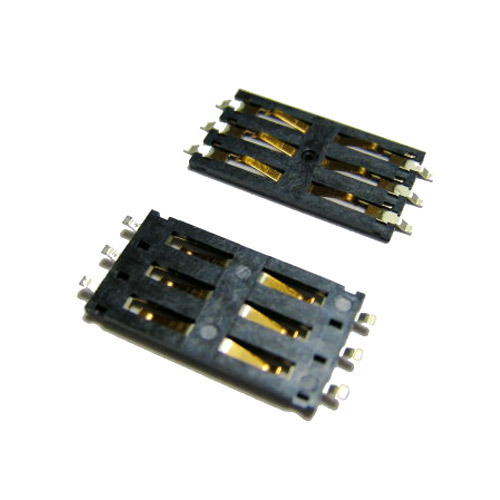 This Sim Card Connectors are extensively used for its advance technology and excellent performance. Also, this Sim Card Connectors are known for their high reliability. Housing: High temperature Plastic UL 94V-0, Color: Black. We are renowned in the market by the name of Arathi Electronics. We came into existence in the market in the year 2012. Our head office is situated in Karnataka in India. Customers can ask their queries and give us views in our head office. With our rich industrial experience, we are engaged in supplying and trading large assortment of LAN Cables, Jumper Wire Cables, Laptop Adapters, Car Chargers, LED Lights, Tablet PC, GPS Navigation Tablets, Electrical Capacitors, Electronic Connectors, Power Supplies and many more products. We also provide bulk of Solder Mask Printing Services & Silk Screen Printing Services. Our products are a source from leading manufacturers of the market. Our services are highly acknowledged amongst the patrons for their reliability and accuracy. Customers like our products for their effective usage in various places and technically advanced. We offer products to our patrons as per the industry standards and in recommended specifications. We are reckoned amongst the customers for offering products after testing them to ensure their correct performance. Moreover, customers can avail products from us at industry leading prices.